2017 Indianapolis 500 champion, the first win by a Japanese driver. 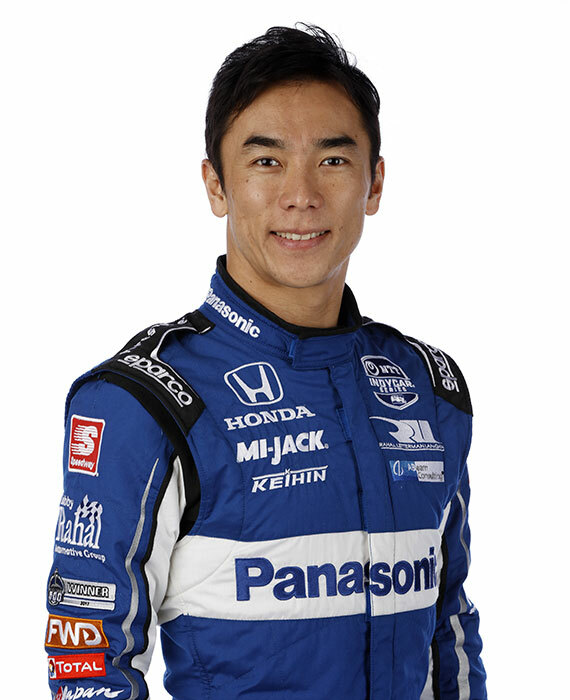 Became the first Japanese driver to win an Indy car race (Long Beach, 2013). In 135 career IndyCar Series starts, he has earned two wins, 16 top-five and 39 top-10 finishes in addition to seven poles. Competed in Formula One for seven seasons from 2002-2008 and made a total of 91 race starts with his top finish of third place coming in the USGP at Indianapolis in 2004. Earned a total of six top-five and 23 top-10 finishes. His breathtaking pass of Fernando Alonso at Montreal in 2007 earned his the “Overtake of the Year” award from F1 Racing magazine. Best F1 season standing was eighth in 2004 after 10 top-10 finishes including five top-five showings and one podium, a third at the USGP at Indianapolis. Also earned a front row start at the German Grand Prix at Nurburgring. 2001 British Formula 3 Champion and won the Marlboro Masters of F3 in Zandvoort and Macau F3 Grand Prix. Began racing karts at the age of 19 after he won several national junior bicycle championships. Sato, 40, was a national high school and university cycling champion in road racing and track cycling. Racing on velodromes was his first experience racing on ovals… Despite not beginning his career in auto racing until he was 19 years old, he progressed to Formula One in only six seasons and went on to become the most successful Japanese driver to compete in F1 after having finished third at the US Grand Prix in 2004… The first race he attended was an F1 race at Suzuka at the age of 10… His career was launched years later when he read about a contest in a racing magazine while in college that ultimately resulted in being one of three drivers to win a racing scholarship. It was a one-shot opportunity due to an age limit and, as he knew it was the career path he preferred over others, he made the most of it… He went on to compete in F1 for seven seasons and made 91 starts… His popularity in Japan has been compared to that of a “Rock Star” which only increased after his Indy 500 win. He is also a popular corporate image character both in Japan and around the globe… GQ Magazine Japan named him of the nine “2017 Men of the Year”… He has been awarded “Goodwill Ambassador” for the British Embassy in Tokyo and used for valuable UK-Japan trade development activities.